The legend that is Hannah Dodds, our talent and events co-ordinator, is leaving Incognito Artists at the end of July after three awesome years with us. Hannah is packing furiously for the trip of a lifetime – she’s off to the greatest little country in the world… NZ of course… and Australia, Vietnam, Thailand, Tahiti… and who knows where else? The world is her oyster. So we’re open to a new member of the family who can fill Hannah’s very capable and awesome shoes. If you know anyone who wants to be part of a small team making a massive difference, please let us know. We can send you the job description. We’ll miss Hannah very much but we wish her a very safe, yet mind-blowing, spectacular, life changing journey over the next 6 months+. We’re grateful she chose to include Incognito Artists in her life’s daring adventure to date. 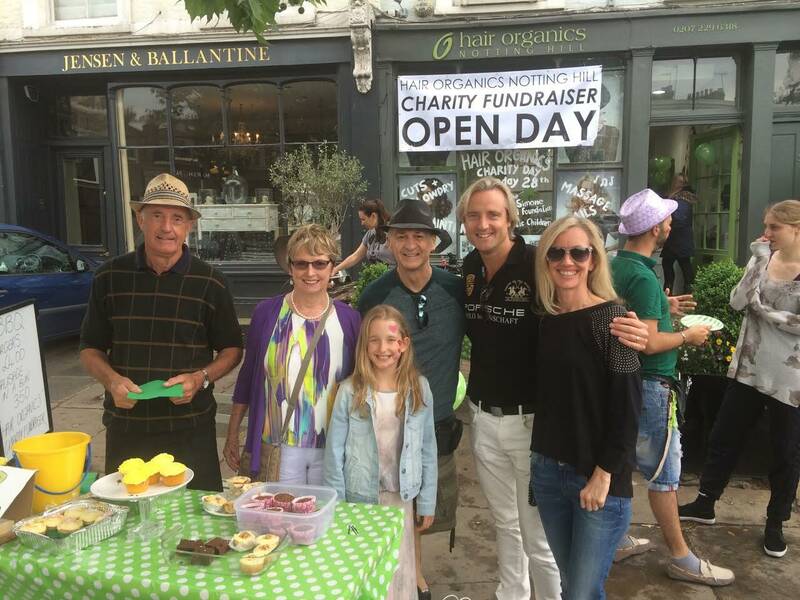 Last Sunday, we were part of an inspiring and fun day at Hair Organics salon in Notting Hill, with all monies raised going to our Sewell Foundation charity (see photo) to treat children with autism in NZ. Mum and Dad are here in the UK for a couple of weeks so no show without punch. Mum was treated to getting her nails done, and chatting to the hair experts, and Dad made himself useful by selling cupcakes to passersby. £1400 was raised at Hair Organics’ busiest charity day yet! BOOM! We’re so grateful. If you’d like to donate online, please click on this link. This glorious heatwave in the UK this week is inspiring me to get outside and live the kind of kiwi outdoors life I grew up living. I’m loving riding my bike to work or meetings, cranking up the BBQ for the family, and making the most of any chance to soak up the sun. Shame I don’t have any golf games scheduled but you will find me basking in the rays at Wimbledon tomorrow, indulging my passion for tennis! Yeah baby. This sudden rush to the head because of London actually having a summer – for as long as it lasts – makes me think about how many of us live life on a regular basis, not looking outside, not making the most of nature. In general, most of us have a life where we’re surrounded by technology instead of living things. We live in a new paradigm where the first thing most people touch when they wake up in the morning is their smartphone, rather than the person next to them. If you’re lucky enough to live in NZ or Hawaii, or similar, chances are you do get outside and make the most of your glorious surroundings. But those of us in big cities can forget to take our shoes off, touch the grass and the earth, and feel grounded again. Studies show that too much time with our tech toys can make us feel lonely or depressed. Forgetting about the environment around us can also make us sick. So let’s power down our devices and spend time on the small stuff. Let’s remember that it’s better for us in a million different ways if we live in harmony with nature, even if we don’t live by the ocean or in a forest; so let’s eat local, seasonal food; walk barefoot through the parks, smell the summer flowers, look up and see how everything looks different against the backdrop of an azure sky. I know I don’t need to fear the weather or worship it. It comes and goes and changes again, just like our moods up and down in response to our thinking throughout the day. The sky doesn’t mind what weather is taking place inside it. Day or night and regardless of what the weather happens to be in this moment, if we are the sky we remain eternally vast, and the light of the sun continues to shine brightly within us even when it’s obscured by darkness or the clouds. But that’s another subject for another day.